Spectroscopy can detect a much wider region of the EM spectrum than the visible wavelength range of 400 nm to 700 nm in a vacuum. A common laboratory spectroscope can detect wavelengths from 2 nm to 2500 nm. Detailed information about the physical properties of objects, gases, or even stars can be obtained from this type of device. 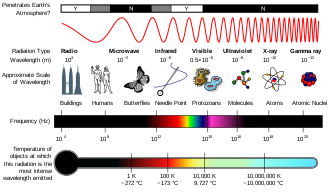 Spectroscopes are widely used in astrophysics. For example, many hydrogen atoms emit a radio wave photon that has a wavelength of 21.12 cm. Also, frequencies of 30 Hz and below can be produced by and are important in the study of certain stellar nebulae and frequencies as high as 7027290000000000000♠2.9×1027 Hz have been detected from astrophysical sources. Microwaves are radio waves of short wavelength, from about 10 centimeters to one millimeter, in the SHF and EHF frequency bands. Microwave energy is produced with klystron and magnetron tubes, and with solid state devices such as Gunn and IMPATT diodes. Although they are emitted and absorbed by short antennas, they are also absorbed by polar molecules, coupling to vibrational and rotational modes, resulting in bulk heating. Unlike higher frequency waves such as infrared and light which are absorbed mainly at surfaces, microwaves can penetrate into materials and deposit their energy below the surface. This effect is used to heat food in microwave ovens, and for industrial heating and medical diathermy. Microwaves are the main wavelengths used in radar, and are used for satellite communication, and wireless networking technologies such as Wi-Fi, although this is at intensity levels unable to cause thermal heating. The copper cables (transmission lines) which are used to carry lower frequency radio waves to antennas have excessive power losses at microwave frequencies, and metal pipes called waveguides are used to carry them. Although at the low end of the band the atmosphere is mainly transparent, at the upper end of the band absorption of microwaves by atmospheric gasses limits practical propagation distances to a few kilometers. Near-infrared, from 120 to 400 THz (2,500–750 nm). Physical processes that are relevant for this range are similar to those for visible light. The highest frequencies in this region can be detected directly by some types of photographic film, and by many types of solid state image sensors for infrared photography and videography. 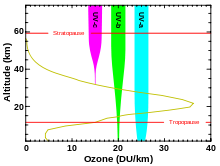 After UV come X-rays, which, like the upper ranges of UV are also ionizing. However, due to their higher energies, X-rays can also interact with matter by means of the Compton effect. Hard X-rays have shorter wavelengths than soft X-rays and as they can pass through many substances with little absorption, they can be used to 'see through' objects with 'thicknesses' less than that equivalent to a few meters of water. One notable use is diagnostic X-ray imaging in medicine (a process known as radiography). X-rays are useful as probes in high-energy physics. In astronomy, the accretion disks around neutron stars and black holes emit X-rays, enabling studies of these phenomena. X-rays are also emitted by the coronas of stars and are strongly emitted by some types of nebulae. However, X-ray telescopes must be placed outside the Earth's atmosphere to see astronomical X-rays, since the great depth of the atmosphere of Earth is opaque to X-rays (with areal density of 1000 g/cm2), equivalent to 10 meters thickness of water. This is an amount sufficient to block almost all astronomical X-rays (and also astronomical gamma rays—see below). ^ a b Elert, Glenn. "The Electromagnetic Spectrum, The Physics Hypertextbook". Hypertextbook.com. Retrieved 2010-10-16. ^ a b "Definition of frequency bands on". Vlf.it. Retrieved 2010-10-16. ^ Bakshi, U. A.; Godse, A. P. (2009). Basic Electronics Engineering. Technical Publications. pp. 8–10. ISBN 978-81-8431-580-6. ^ a b c d e Mehta, Akul. "Introduction to the Electromagnetic Spectrum and Spectroscopy". Pharmaxchange.info. Retrieved 2011-11-08. ^ Haitel, Gary (2014-05-15). Origins and Grand Finale: How the Bible and Science relate to the Origin of Everything, Abuses of Political Authority, and End Times Predictions. iUniverse. ISBN 9781491732571. ^ "Herschel Discovers Infrared Light". Cool Cosmos Classroom activities. Archived from the original on 2012-02-25. Retrieved 4 March 2013. He directed sunlight through a glass prism to create a spectrum […] and then measured the temperature of each colour. […] He found that the temperatures of the colors increased from the violet to the red part of the spectrum. […] Herschel decided to measure the temperature just beyond the red of the spectrum in a region where no sunlight was visible. To his surprise, he found that this region had the highest temperature of all. ^ Davidson, Michael W. "Johann Wilhelm Ritter (1776–1810)". The Florida State University. Retrieved 5 March 2013. 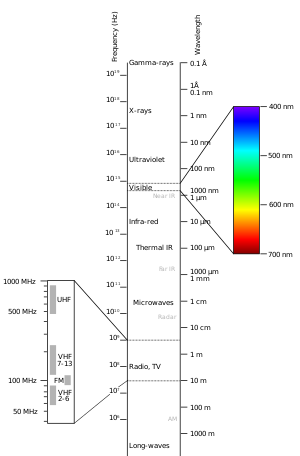 Ritter […] hypothesized that there must also be invisible radiation beyond the violet end of the spectrum and commenced experiments to confirm his speculation. He began working with silver chloride, a substance decomposed by light, measuring the speed at which different colors of light broke it down. […] Ritter […] demonstrated that the fastest rate of decomposition occurred with radiation that could not be seen, but that existed in a region beyond the violet. Ritter initially referred to the new type of radiation as chemical rays, but the title of ultraviolet radiation eventually became the preferred term. ^ Mohr, Peter J.; Taylor, Barry N.; Newell, David B. (2008). "CODATA Recommended Values of the Fundamental Physical Constants: 2006" (PDF). Reviews of Modern Physics. 80 (2): 633–730. arXiv:0801.0028. Bibcode:2008RvMP...80..633M. doi:10.1103/RevModPhys.80.633. Archived from the original (PDF) on 2017-10-01. Direct link to value. ^ Condon, J. J.; Ransom, S. M. "Essential Radio Astronomy: Pulsar Properties". National Radio Astronomy Observatory. Retrieved 2008-01-05. ^ Abdo, A. A.; Allen, B.; Berley, D.; Blaufuss, E.; Casanova, S.; Chen, C.; Coyne, D. G.; Delay, R. S.; Dingus, B. L.; Ellsworth, R. W.; Fleysher, L.; Fleysher, R.; Gebauer, I.; Gonzalez, M. M.; Goodman, J. A.; Hays, E.; Hoffman, C. M.; Kolterman, B. E.; Kelley, L. A.; Lansdell, C. P.; Linnemann, J. T.; McEnery, J. E.; Mincer, A. I.; Moskalenko, I. V.; Nemethy, P.; Noyes, D.; Ryan, J. M.; Samuelson, F. W.; Saz Parkinson, P. M.; et al. (2007). "Discovery of TeV Gamma-Ray Emission from the Cygnus Region of the Galaxy". The Astrophysical Journal. 658 (1): L33–L36. arXiv:astro-ph/0611691. Bibcode:2007ApJ...658L..33A. doi:10.1086/513696. ^ L'Annunziata, Michael; Baradei, Mohammad (2003). Handbook of Radioactivity Analysis. Academic Press. p. 58. ISBN 978-0-12-436603-9. ^ "Gamma-Rays". Hyperphysics.phy-astr.gsu.edu. Retrieved 2010-10-16. ^ "Advanced weapon systems using lethal Short-pulse terahertz radiation from high-intensity-laser-produced plasmas". India Daily. March 6, 2005. Archived from the original on 6 January 2010. Retrieved 2010-09-27. ^ Koontz, Steve (26 June 2012) Designing Spacecraft and Mission Operations Plans to Meet Flight Crew Radiation Dose. NASA/MIT Workshop. See pages I-7 (atmosphere) and I-23 (for water).